"The steel and the space, or the object and the void, become one and the same." The term "Post-Minimalism" was first used in reference to a range of art practices that emerged in the wake of Minimalism in the late 1960s. In a similar manner to the term "Post-Impressionism" it serves to gather together a range of styles that are related, yet which often have very different, even opposing interests. Post-Minimalism refers to tendencies such as Body art, Performance, Process art, Site-Specific art, and aspects of Conceptual art. Some artists associated with this tendency sought to extend the Minimalists' interest in creating art objects that do not have the representational function of traditional sculpture, objects that are abstract, anonymous in appearance, and have a strong material presence. But other Post-Minimalists pursued very different goals: many reacted against the earlier movement's impersonality, trying to invest sculpture once again with emotionally expressive qualities. While the formal and theoretical interests of this period are no longer so influential, many of the themes and strategies of Post-Minimal artists remain very current, making it one of the most enduring styles of the last half-century. Some Post-Minimal artists were interested in extending Minimalism's interest in anonymity and in emptying artwork of the artist's personal expression. Instead of using industrial materials and impersonal methods of fabrication to achieve this, they used other strategies. They presented material in ways that seemed unprocessed or uncomposed, or the material drooped and sagged, clearly governed more by the character of the material rather than the artist's intentions. To distinguish it from Minimalism's perceived concern with form and composition, this is referred to as "anti-form." Some Post-Minimalists shared the Minimalists' interest in abstraction and materiality, yet rejected their preoccupation with industrial materials. They also rejected the movement's mood and rhetoric, often perceived as cold, over-intellectual and even authoritarian, responding with sculptures of more expressive qualities, often evoking the body and aspects of sexuality. Many Post-Minimal artists admired Minimalism's break with conventional formats of painting and sculpture, wanting to investigate new limits or traditions in the making of art. Some believed that the chosen material should govern the character of the art object. Others believed in a more expanded sense of technique that encompassed the artist's processes, the materials and even the way gravity operates on materials. Some artists also took the cue to get out of the gallery and install art in new environments. This led to a new interest in the relationship between the artwork and its site, called Site-Specificity. Others took artwork into the natural environment in the Land art movement. New developments in art came fast in the 1960s. No sooner had Minimalism emerged onto the public stage than Post-Minimalism surfaced. In a 1966 New York exhibition entitled Eccentric Abstraction, critic Lucy Lippard curated work by a group of artists, including Eva Hesse, Louise Bourgeois and Bruce Nauman. Containing work with highly personal and sensuous qualities, it drew on traditions of Surrealism, Dada and Expressionism. The pieces often combined unusual, soft and pliable materials. Some borrowed the modular, repetitive compositions typical of Minimalism, but many also exploited more relaxed and open structures. This seminal work was created in the studio Nauman established in an abandoned grocery store in San Francisco and modeled after the neon advertisement signs nearby. It acts as an advertisement of a different kind. Its colorful, circular text proclaims the words of the title: "The True Artist Helps the World by Revealing Mystic Truths." It is characteristic of Nauman's early neon works, and typical of the tone of dry satire in much of his oeuvre. Commenting on high art in the materials of low culture and advertising, it sets up a clash that questions old assumptions about the purpose of art and artists, like are artists just ordinary salesmen? One might say that the piece is Post-Minimalist simply by virtue of standing at the borders of so many different styles and approaches of the period, borrowing from Pop art's interest in advertising, and Conceptual art's interest in language. A Line Made by Walking is highly characteristic of the conceptual Earth art created by British artist Richard Long. In making a line across the grass by the simple act of walking, Long creates a type of drawing-without-drawing, doing away completely with the conventional tools and using instead his body and nature. Abandoning the traditional art object in this way is typical of Post-Minimalism, as is the way in which Long's line draws attention to the passing of time and the specific, fleeting moment in which the line was made. Although usually regarded as an artist's statement (akin to a private, reflective diary entry), Verb List might also be regarded as the artist's chronological, aesthetic agenda, setting out his subsequent development in sculpture. It also amounts to a catalogue of the creative procedures employed by process artists linked to Post-Minimalism. If the 'to' verbs denote acts already accomplished, and the 'of' verbs are those yet to be done, Verb List may also be viewed as a shorthand, visual retrospective of Serra's entire career, compressing past, present and future into a single material object. Like a map, or a theoretical diagram, Verb List finally 'stands in' as a visual and conceptual proxy for something more physically tangible, or virtually touchable—sculpture itself. Serra's later, monumental walls in steel ultimately come to embody, in more abstract and open-ended terms, what the artist has chosen to conjure here in the 'mind's eye' of the beholder, indeed by way of strictly linguistic medium. 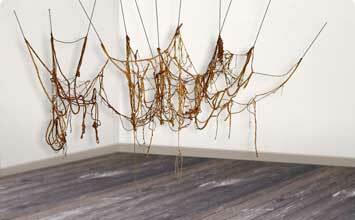 Eva Hesse was one of the artists included in Lucy Lippard's ground-breaking 1966 show Eccentric Abstraction. She was profoundly influenced by the Minimalist Carl Andre, yet her work is characteristic of feminist responses to that earlier movement. This Untitled piece uses soft and malleable materials like as cloth, latex and wire mesh. They are unconventional for an artwork of this period, combining the Minimalist industrial, with the somewhat domestic. The effect they create is organic, the two dangling appendages at the center of each square evoking wobbly legs. The bulging, irregular frames of the four squares seem to mock the perfect straight angles of Minimalism, even as they hang on the wall like conventional paintings. Hesse's work is typical of those among her peers who borrowed the anonymous language of Minimalism, but rejected its austere formalism, reintroducing emotionally expressive qualities. Spiral Jetty is a legendary example of Earth Art and a typical Post-Minimalist rejection of industrial forms and motifs. Its interest in process and time embraces themes relating to entropy, depletion and exhaustion. The northern section of the Great Salt Lake, where Smithson chose to site Spiral Jetty, was cut off from fresh water supplies when a nearby causeway was constructed by the Southern Pacific Railroad in 1959. This produced a concentration of salt-tolerant bacteria and algae, producing the water's unique red-violet coloration. Smithson particularly liked the combination of colors because it evoked a ruined and polluted, science fiction landscape. By inserting the Jetty into this damaged section and using entirely natural materials native to the area, Smithson called attention to this environmental blight. Nevertheless, he also sought to reference the importance of time in eroding and transforming our environment. The piece's coiling structure was inspired by the growth patterns of crystals. Yet it also resembles a primeval symbol, making the landscape seem ancient, and at the same time futuristic. Vito Acconci's work of the 1960s is typical of the openness and variety of Post-Minimalism, since it seems to obey few borders, having no single identifiable style, using no single medium, and crossing many fields, including Performance and Conceptual art. Trademarks is also typical of his engagement with Body art. To create it, he repeatedly bit himself in various places on his body in order to leave indentations. He used his body as a malleable substance that was altered and manipulated. The bite marks are uniquely his, and he uses them to brand as much of his body as possible. The marks are signatures of authorship that have migrated from the conventional artwork on to the artist's own body, hurting himself in the process and suggesting a kind of sexual violence, something private and taboo. The discomfort with authorship is characteristic of the ethos of much art produced in the 1960s.